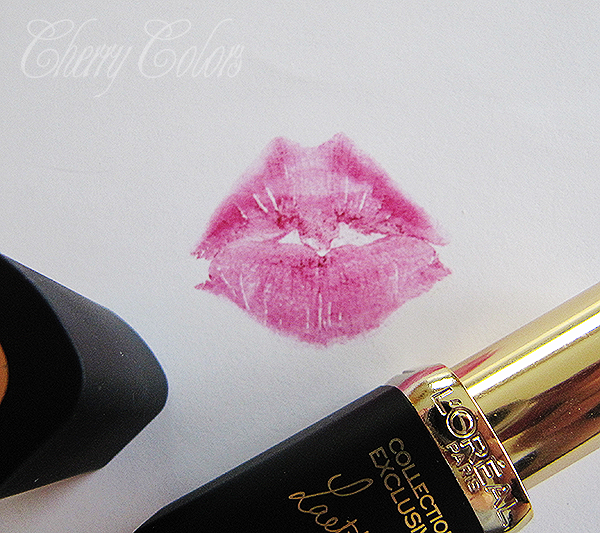 Review & Swatch: L'Oreal Laetitia Pure Red - Cherry Colors - Cosmetics Heaven! 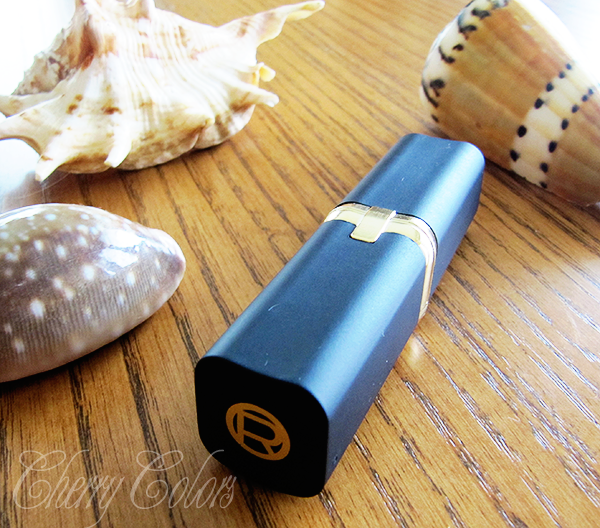 I got this amazing lipstick for my birthday, it was a gift I *heavily* hinted for. 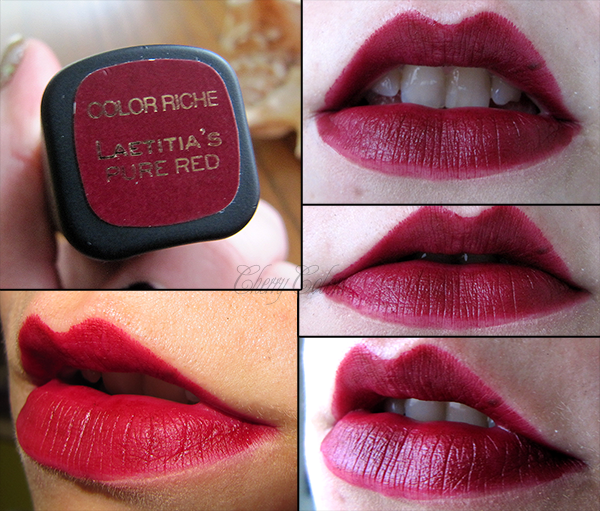 Well let's say I gave my dear a choice of lipsticks and he picked this brand and color. I love it! So, it's supposed to be a Limited Edition by L'Oreal - a brand I refused to buy from for so many years (several reasons). 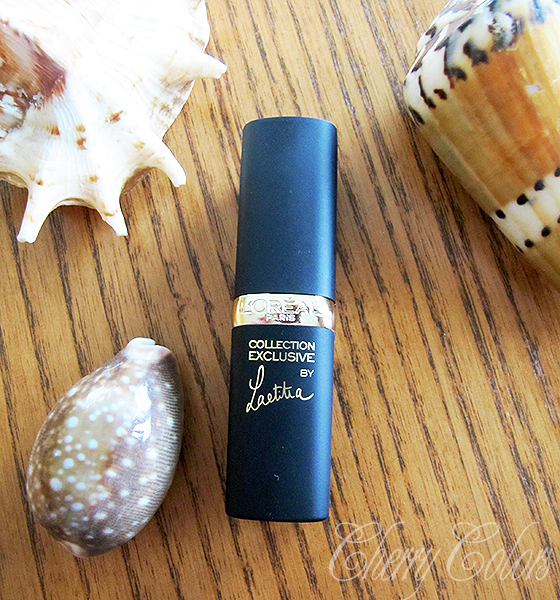 But a lipstick from their collection was on my WL, thanks to Gejba's raving about them. 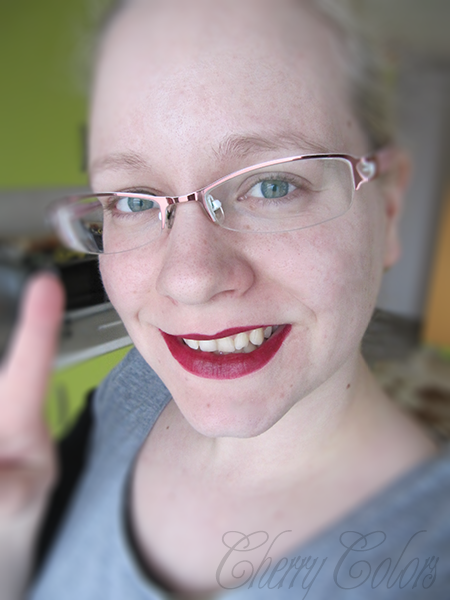 Yes, it's your fault, Gejba :P.
I am a huge fan of matte lipsticks because they last longer on me and I like the shine only during Summer days. It's weird, but it's like that for me. Anyway this lipstick is a dark red lipstick with purple undertone. The packaging is supposed to be textured, but mine isn't (Why?! I feel like I'm missing out on the texture ;_;). 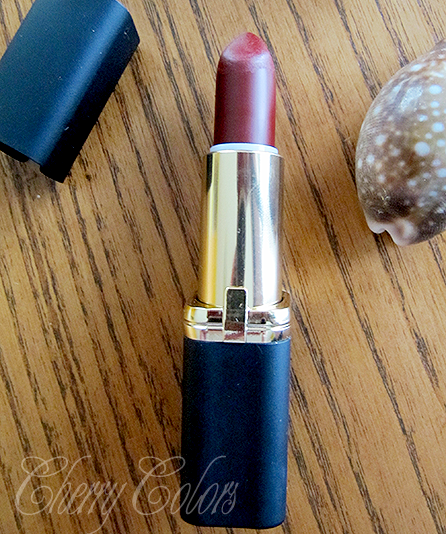 There's one reason why I am a big fan of this lipstick. 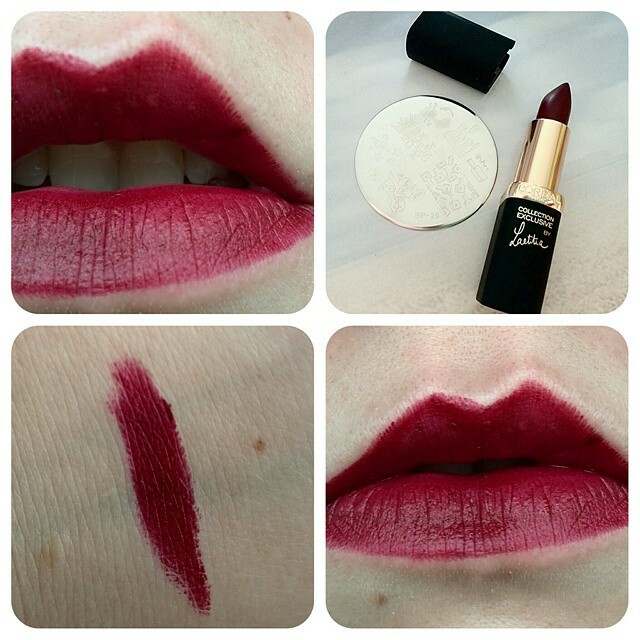 "I tested the lipstick one evening and went and kissed my kid. It left a lovely mark and off I went. I didn't clean him, because I had in mind that I'll bathe him in an hour. Okay, here comes the hour and I scrub, scrub, scrub, but it doesn't want to get off! I was also biting my lips and thinking how I must have red teeth by now. Well, I check in the mirror and nothing. Perfectly intact lipstick. I had to use the oil make up remover to get the lipstick off from both of us!" Once it settles, it's on and doesn't get off. It can survive about 5-6h on me (with eating and careful drinking). It does get off little by little if you drink a lot. Also, you *need* a good lip liner before it (I use the Essence transparent lip liner, because.. I don't want or need 30 lip liners..). It may bleed on you. It did on me, when I applied the lipstick like 6 times (I was bored and I kept drinking coffee). I realized.. that I need to be more precise while applying dark lipsticks. Or taking pictures of them, whoops :P.
Do you see how happy it makes me? 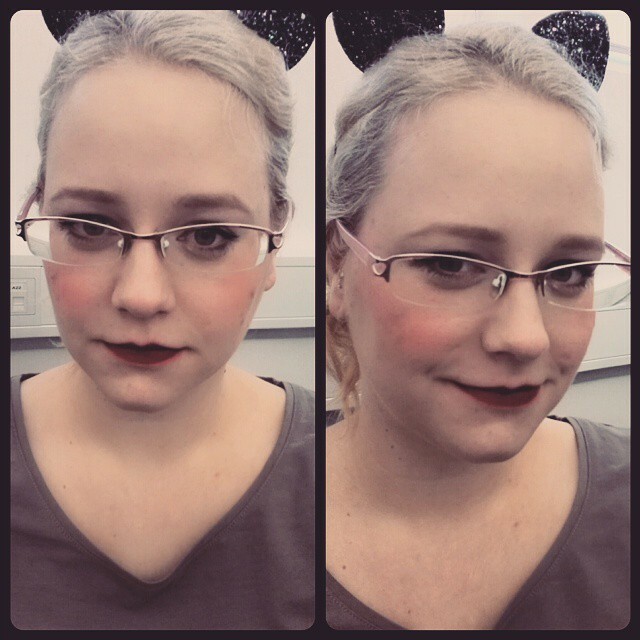 I even don't care how bad I look, as long as the lipstick looks fine! And some heavy filtered IG picture (sorry!) - It is nice and dark! In conclusion; Everyone needs it. I needed it and didn't know I did. 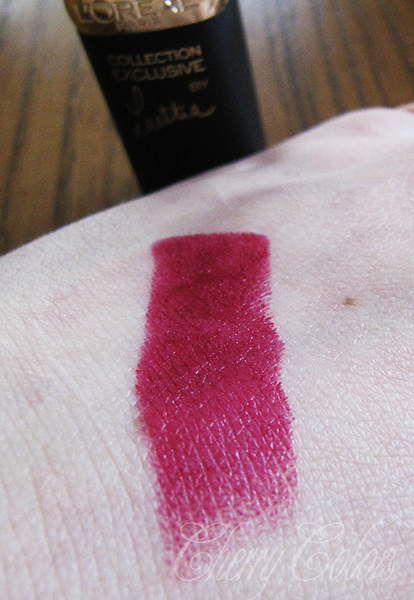 Also, it's not the cheapest lipstick (13€), but it's well worth it. What do you think? Do you have it?